Good looking rig, know you will enjoy. I replaced the cutting board with a drawer also and find the cutting board fits in the sink opening where items being cut or chopped will just fall into the sink. Much easier to clean up especially if liquid is involved. 1. We ordered the table for in front of the sofa. The table is not standard on the 2910. They figure that you eat off of the small table between the two Euro chairs which, for us, is not a solution. There was no place to store the table, legs and spider feet so we built a mount out of aluminum storm panel header and foam to protect the edge of the table. It is secured to the wall behind the Euro chair. 2. 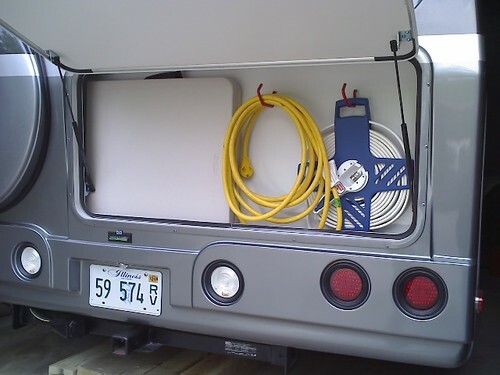 George built a shelf in the rear of the coach to hold "stuff"--propane, torches, polishes etc. 3. We also had the front windows tinted. That Florida sun is a killer! It also bothered him when driving. Good Job / Nice ideas.... keep em coming. Very nice for organizing lots of the little things. 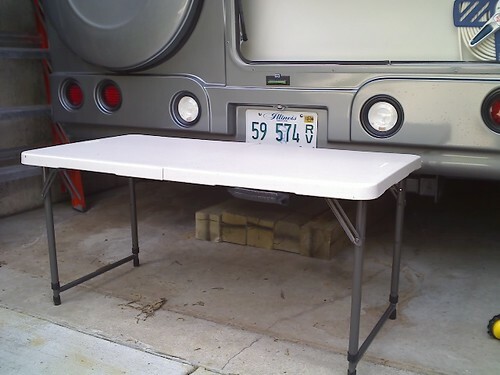 I found the rear storage compartment ideal for this nice 2-person folding table It's great to have as a primary table under the awning, or as a secondary table if you are able to move a campsite picnic table under the awning. Either way, this table is great. 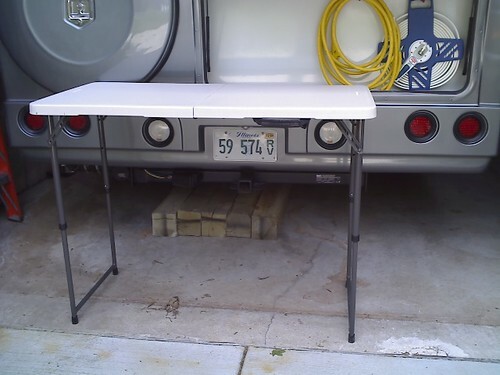 We like to place it next to the outside outlet, a nice place for the coffee pot, crock pot, radio, etc. It has 3-position adjustable legs, this picture shows the low setting. - Tall is nice for standing next to, also nice to keep kids and dogs away from things you don't want them to get at. Here is the tall setting. We bought ours 4 years ago at a Costco but not sure if they still sell the same model with adjustable legs. I have recently seen a non-adjustable leg model at Walmart. George, how did you secure the shelf? Is there solid wood thru there? I added a 1x1 under the top shelf. I use anchors in the wall to hold the 1x1. I've used this same shelf in the 2 prevous PC's without the 1x1. I have another storage area under the slide for my cables and hoses. I've added a shelf to keep them separate.